Charming, aren’t they? 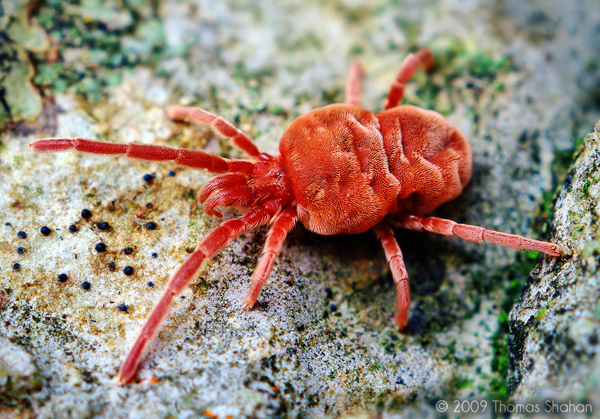 They’re chiggers (yes, like the kind that feast on our ankles). I want to know why they like lizards so much. More specifically, I want to know how hormones affect mite load in these lizards. 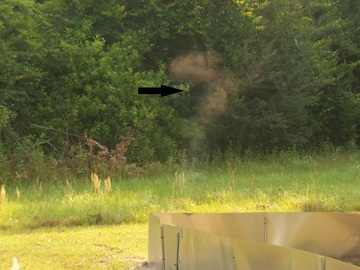 Part of my research this summer (in theory) involves finding a site with a bunch of chiggers. 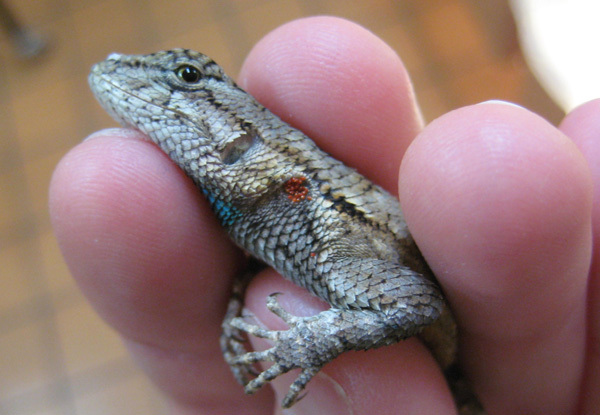 There are fence lizards in some areas of Pennsylvania that have mites, so why not look close to home? 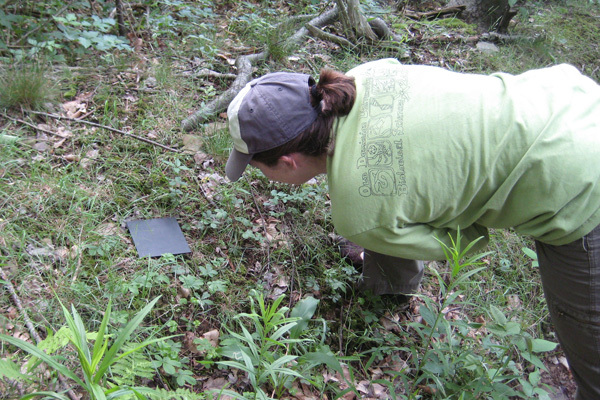 I coerced Renee into attempting to survey mites at a site in Huntingdon County. In an area with a high density of mites, you can place a black plexiglass square on the ground and mites should scurry across it within a minute or two. Alas, there didn’t appear to be many mites at this site. We tried! Renee and I began to drive away when we stopped for a gate. We joked about it being locked. We shouldn’t have joked. There was a ditch on one side of the gate and a mountain on the other, so there was no going around. We were stuck inside. Well shucks. Renee and I began to stress eat potato chips while calling the one contact we had who might have some ideas. No answer. 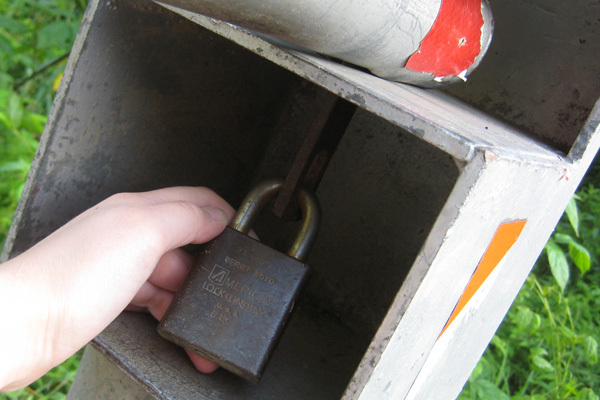 One lock on the gate was a 4-digit combination lock–I tried to think of important numbers: when was the field station founded? 1974? Nope, that didn’t work. Hmm. We made a many-point turn in our rather large field vehicle and headed back toward the little building that was locked in with us. On peering in one window, we found a white board with emergency phone numbers. While Renee made some calls, I kept looking in windows. Renee tried the first number to no avail. She began the second when I discovered a note left near a window that looked promising. I squished my face against the dirty glass and tried to read the upside-down writing. This fortuitously placed note contained our salvation! Renee and I rushed back to the car and drove to the gate. We were almost out of potato chips; this had better work! Renee slid the numbers to the appropriate code…and it didn’t work. I gave it some love, put in the numbers again, and mercifully it clicked open. Phew! All in all, only 12 minutes of worry, though it certainly felt like much longer. Oh, I mustn’t forget these important updates from our adventure! The following week, I investigated another site, which also involved climbing a mountain. Again, there were no mites, and I accidentally hiked 6 miles. Whoops. 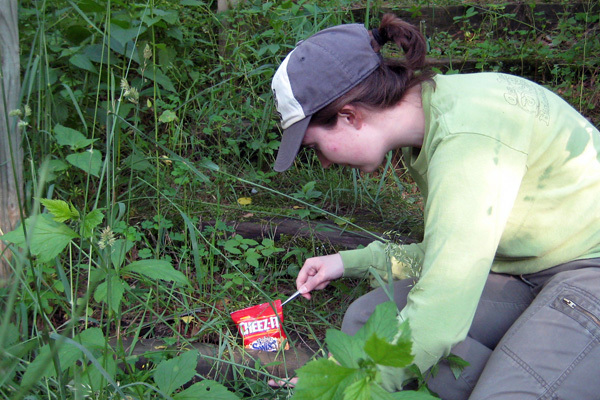 Categories: Research in PA | Tags: cheez-its, fence lizards, mites | Permalink. Whilst our lizard work continues apace, in our downtime at Chez Rome Pond House we like to experiment in our full kitchen (a major upgrade over last year). 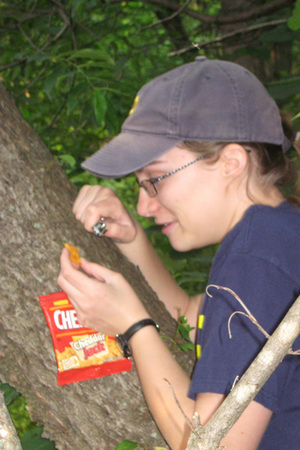 And of course, many of our pieces de resistance center around our lab’s favorite ingredient: Cheez-Its. 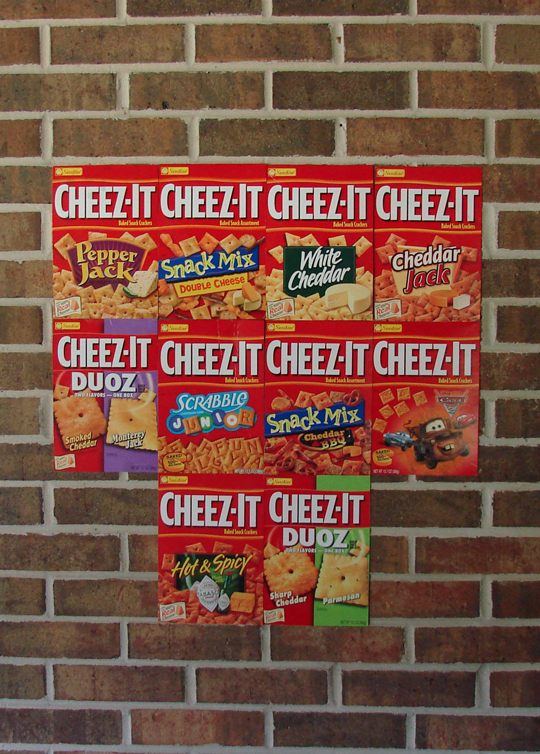 We’ve worked with many different incarnations of the Cheez-It throughout the year (as evidenced by our Acheezement Wall), but our latest creation makes use of the Hot & Spicy Cheez-Its which are flavored with Tabasco sauce. 10 Flavors in under 10 weeks…quite an acheezement. While carefully culling 7 egg yolks for a frozen Key Lime Pie to bring to a recent cookout, I found myself with the unsurprising remainder of 7 egg yolks. 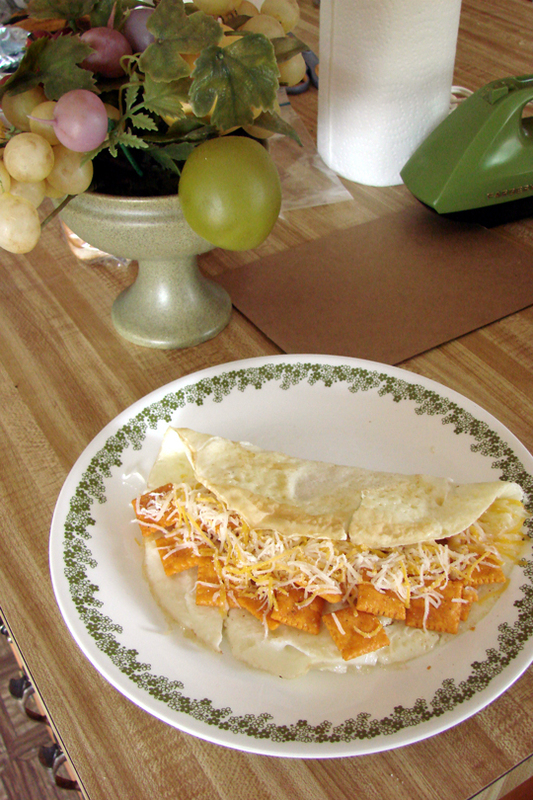 Being morally opposed to food wastage of any stripe, I decided to make a somewhat healthy, egg-white omelette. But what to put inside? Field research doesn’t lend itself to a fridge full of fresh mushrooms, spinach, avocado, and pancetta (my preference). A quick perusal of the kitchen cabinets was enough to insure inspiration, however. My inaugural box of Hot & Spicy Cheez-Its would be a perfect way to reduce the health-factor of this monstrosity and the crispity-crunch of the crackers would provide a delicious textural counterpoint to the toothsome egg-whites. I stuffed the resulting omelette with some artisanal Great Value Shredded Fiesta Blend Cheese (you can tell a cheese’s quality by how many words are in its name) and finished it with a generous sprinkling of Sriracha and a dash of salt and pepper. Author’s note: For the naysayers out there, this was actually pretty good. I haven’t dared to calculate the nutritional facts for it however. Categories: Summer 2012 Field Trip | Tags: cheez-its, field trip | Permalink. 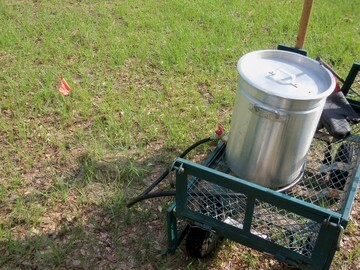 For one part of this experiment, we did a fire ant capture (Chris will be writing a future blog post on this). We kept these fire ants in captivity without food for a few days so we knew that they were hungry. One question that we wanted to answer was that we wanted to see if fire ants would be able to eat a fresh fence lizard egg and/or an older fence lizard egg. In these confined conditions (see Chris’s post), they were able to penetrate through both types of eggs. For the main part of the experiment, I will be seeking out 10 different fire ant mounds around the Pond House/Solon Dixon campus. I’ll be testing out four different treatments to observe fire ant predation habits. Should be interesting! More to come! 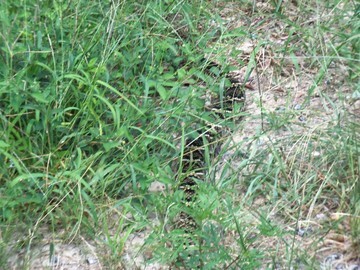 Not related to the project, but still herp-related, I saw my first eastern diamondback rattlesnake! I was returning fence lizards at Geneva State Forest and pulled over on the side of the road when I saw a 5-6 foot snake trying to cross the road on my way back to the Pond House. I ran out of the car to see what it was (forgetting my camera in the car and having to run back for it). Sorry the picture is so bad. What an amazing herp! Categories: Summer 2012 Field Trip | Tags: by Jill, field trip | Permalink. 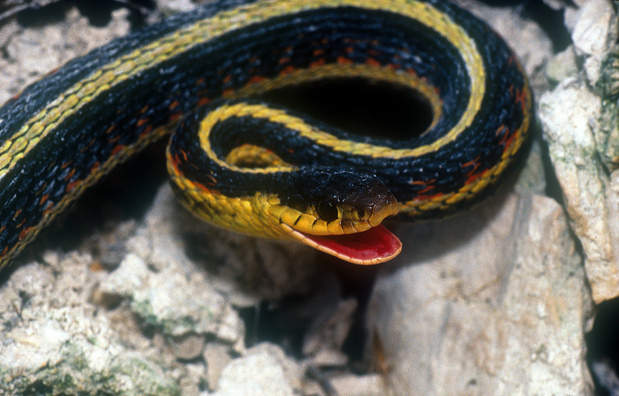 Prize-winning snake mating behavior research? It’s up to you. I’m sure for those of you who have followed our field blogs for the past three years (2010,2011, and now 2012) it has become clear that we’re excited about herps. 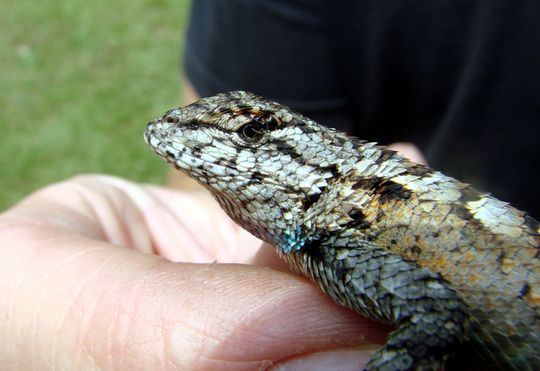 Although the lab’s research focuses on eastern fence lizards, there are so many other exciting snakes, frogs, and lizards! Many of us do research with some of these other species, including Dr. Tracy Langkilde, our fearless leader, who has done some fascinating work with red-sided garter snakes (picture below, photo compliments of Tracy Langkilde). This article is so well-written and the science is so exciting, it has been nominated for the 2012 Science Prize from 3 Quarks Daily, a web news blog. Indeed, this fascinating research is in the top 20 of the nominees! However, to move on to the next round this article needs votes from the public. Please – go ahead and show your support for the Langkilde lab, and cool research with herps! All you have to do is go to this online voting website, go through the alphabetized list to “The Scorpion and the Frog: Snakes Deceive to Get a Little Snuggle.” Voting closes tomorrow at 11:59 pm (EST), is free, and requires no personal information from you. Please take a second to go ahead and vote. 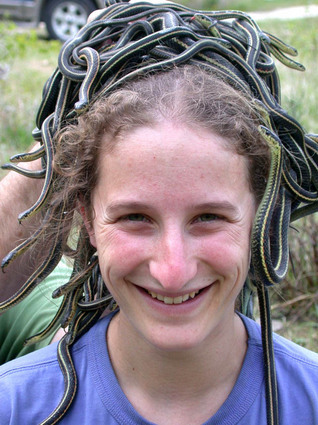 Is this prize-winning research on snake mating behavior? It’s up to you! Categories: Summer 2012 Field Trip | Tags: by Renee, herps | Permalink. Eye’ll Get You My Pretty! While our research generally focuses on the effects of invasive fire ants on fence lizards, we also observe interactions between fence lizards and other ants. In general, both fire ants and native ants are prey for fence lizards; juvenile fence lizards especially have a high proportion of ants in their diet. It’s not uncommon to see a fence lizard camped out on a downed log or tree trunk, snapping up ants as they walk by like a conveyor belt of lizard snacks. While fire ants can pose a significant threat to fence lizards due to their venomous stings and ability to recruit very quickly to attack, native ants are not defenseless. We got a great reminder of this a few days ago due to the diligence of students in the Auburn University Wildlife Sciences Summer Practicum. I had just given them a quick presentation on our research along with tips and a demonstration of how to noose lizards. We roamed the Solon Dixon grounds searching for all types of lizards (including green anoles, skinks, and racerunners) to observe and noose. Later in the morning, as I was working in the lizard room, two students knocked on my door with a previously unmarked lizard for me to take measurements of. As I examined her, I noticed that she had a strange feature on her face: an eyebrow piercing! An ant had latched on to and attacked the scale above her eye (a weak spot in a lizard’s armor that ants often exploit). Fortunately, the ant had not attacked her eye scale itself, so her vision should continue to be good (although she may keep a better eye out for ants from now on!). I removed the ant and preserved it in ethanol for later identification. On examining the tree trunk where she had been caught, I noticed a now unmolested parade of the same native black ants trundling upwards into the canopy. Meanwhile, back at the Pond House for lunch, I took a quick gander at the ant under our dissecting scope and tentatively identified it as a member of the genus Crematogaster, a group of ants with neat, heart-shaped abdomens (I’ll need someone more familiar with ant taxonomy to fully identify it). She really got an eyeful from her perch on the tree trunk! 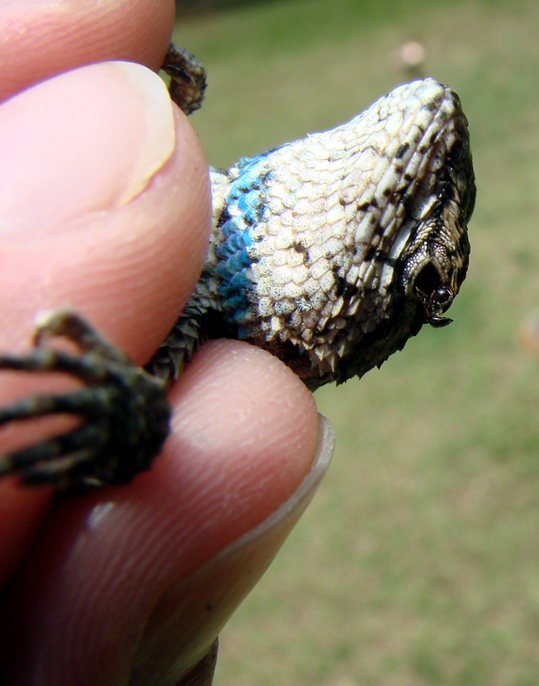 Categories: Summer 2012 Field Trip | Tags: fence lizards, field trip, fire ants, native ants | Permalink. While we specialize in Ecology here in the Langkilde Lab, inquiring minds always want to know; in this case, I was super-excited to see the transit of Venus this past Tuesday. In case you had somehow disappeared from the internet, a quick recap is in order: while Venus’ orbit does lie between the Earth and the Sun, it rarely passes directly between them because the orbits are at slightly different angles. Venus passing between the Earth and the Sun (called a transit of Venus) happens only twice every 113 years or so, making it the rarest type of solar eclipse in some books. Our last transit of Venus occurred 8 years ago, and the next won’t happen until 2117, meaning this is the last time for most of us to see it in our lives, barring some serious medical advances. The transit of Venus is also historically important, as 18th century astronomers used measurements taken by multiple observers around the world to more accurately calculate the Earth’s distance from the Sun (in what may have been the world’s first crowdsourced science project). The transit was visible here in Andalusia from about 5 pm onwards, making for an approximately 3 hour long viewing window prior to sunset. Unfortunately, thunderstorms rolled in in the afternoon (as is their wont), and the western sky was full of clouds. After gazing at the sullen, grey sky for about an hour and with no change in the forecast on the horizon, I disappointedly took a shower to wash away my bitter tears. Howeever, at about 6:30, the clouds broke majestically and rays of sunlight shone right through the wet hair in my face as I was getting out of the shower. I threw some shorts on and ran outside to prep my viewing setup. As staring at the Sun is generally inadvisable (unless you’re happy to go blind), an alternate viewing method is required. I chose to project the Sun’s image (a technique I learned in Camp Susque’s astronomy class). By taking the spotting scope we use for identifying lizards and aiming it straight at the Sun, I projected an image of the Sun onto some white paper (datasheets) that I had on a clipboard. I wasn’t sure how well this would work, but Venus was clearly visible along with some sunspots. Very neat! 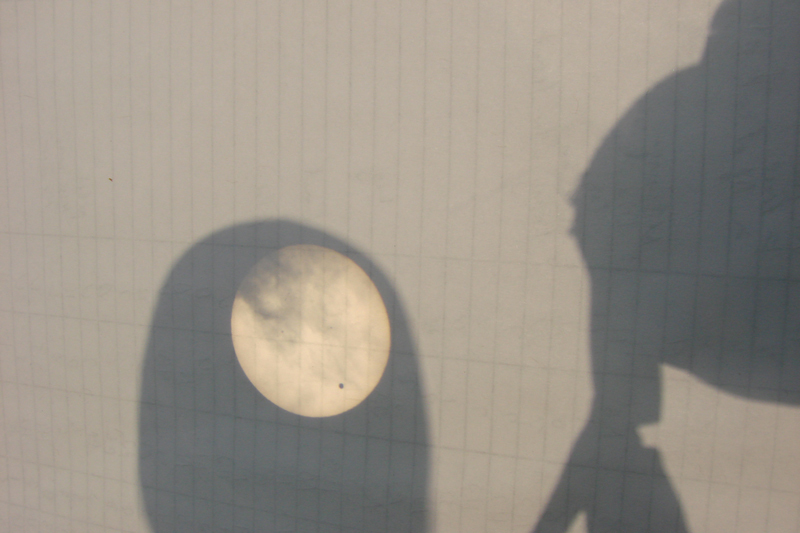 The Sun projected in the shadow of the scope with Venus visible as well as some clouds. 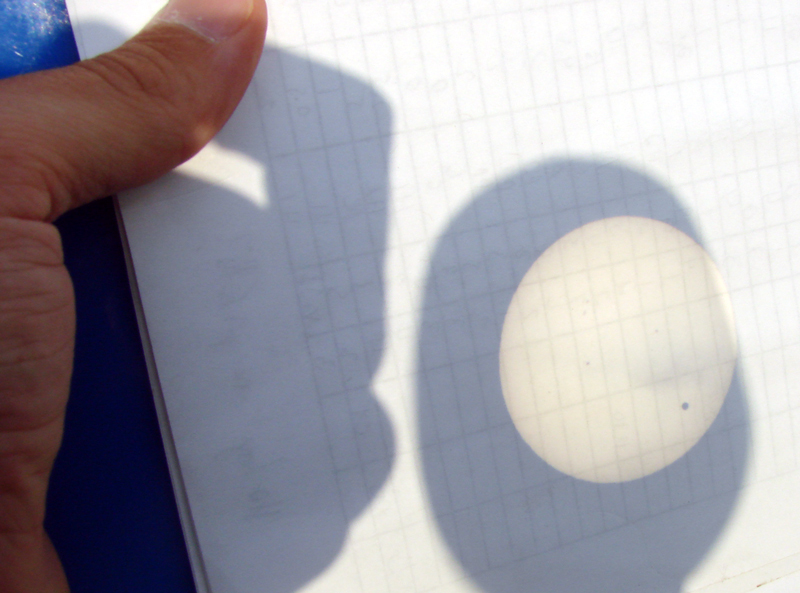 Another view of the projection; if you look closely, you can see sunspots! Well, that’s all for astronomy until the Perseids in August! Categories: Summer 2012 Field Trip | Tags: scenery | Permalink. We get up early in the morning because the fire ants are more active in the morning compared to the afternoon when it’s really hot outside. 7:30 AM – 8:00 AM: Wheel the cart around to the flagged areas. 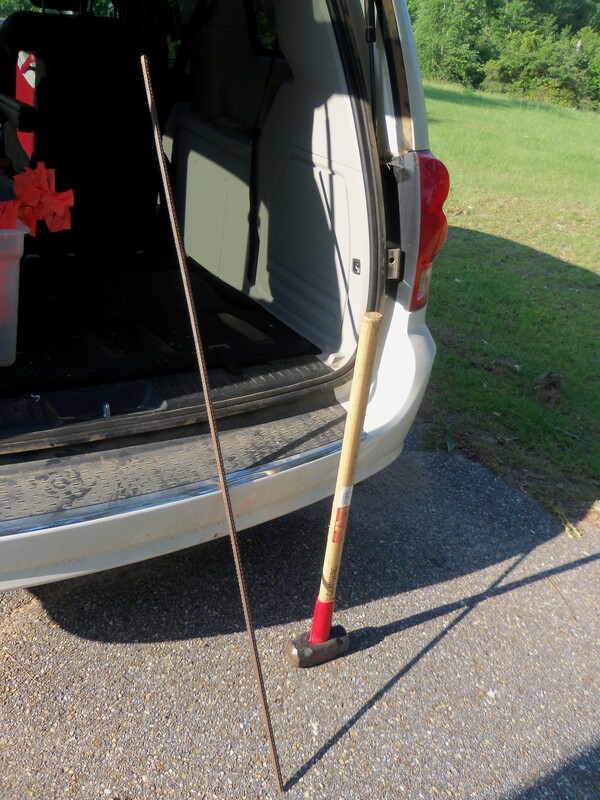 Using a rebar (a 4ft reinforcing bar) and a sledge hammer, we drop holes into fire ant mounds. We try to make the holes as deep as possible because the goal is to reach (and kill) the queen of the colony. She may be up at the surface or down in the egg chamber. 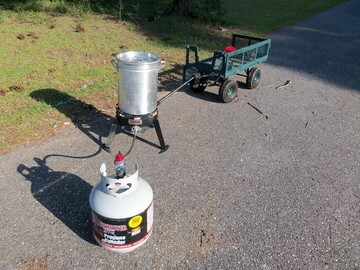 After holes are put into the mounds, we take the hose attached to the fryer and pour boiling hot water into the holes until they overflow. We then pour boiling hot water on the ants that storm out of the holes looking to attack us. Using this method is safer than using insecticides. Insecticides can kill multiple species of arthropods and part of Chris’s project includes surveying arthropods (before and after fire ants are killed). 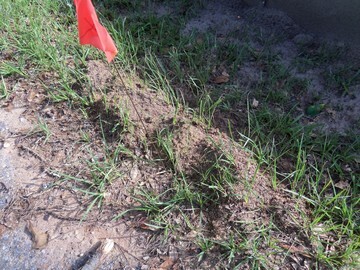 The method we use is safer because we can target just the fire ant mounds and not kill other arthropods in the area. Categories: Summer 2012 Field Trip | Tags: by Jill, enclosures, fence lizards, field trip, fire ants | Permalink.